In the first five months of 2017, there have been 47 confirmed cases of Valley Fever in San Luis Obispo County and five deaths. Over the past eight years, the number of confirmed cases has more than doubled. In 2017, the number of Valley Fever cases is slated to spike. During a drought, the fungus is not as active as it is during wet years, said SLO County epidemiologist Ann McDowell. Valley Fever infections surge in the late summer and fall. “We have seen in the past, that when a drought cycle is broken, we see more Valley Fever case,” McDowell said. In 2009 there were 87 reported cases in San Luis Obispo County. Last year, there were 220 confirmed cases of Valley Fever and five deaths. 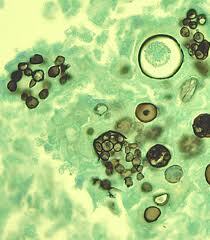 The disease is spread by a fungus that grows naturally in portions of Arizona and California. In the past, most cases of Valley Fever were found in the Central Valley. Now, San Luis Obispo County is becoming a hot spot. In contrast, in 2016 Santa Barbara County reported only 56 cases of Valley Fever. Most people who breathe in the spores develop no symptoms at all. Others, about 40 percent, develop flu-like symptoms including cough, congestion, fever, fatigue, body aches and headaches that can last a month or more. Valley Fever can lead to severe pneumonia, meningitis and death. The Mayo Clinic’s website advises people in areas with the spores to be aware of the symptoms. With treatment at the first sign of symptoms, most people will recover without problems.